For thousands of years, Chinese farmers have relied on their experience to grow crops, but Zhang Yufeng in central China's Henan Province has recently turned to big data. A screen in his field shows temperature, humidity, wind, rain, soil conditions, pest control and disaster warning information. In March, the warning of a cold spell reminded him to take precautions, which prevented a loss of 133-hectares of wheat. The data and information Zhang receives is provided by a satellite-land system at the local agricultural meteorological station in Xun County, the city of Hebi. The system, put into operation in 2015, gets real-time data on temperature, humidity, wind direction, soil temperature and humidity, etc., with 39 sets of land-based sensors installed in the field. The data will be compared with that collected by Fengyun meteorological satellites to provide accurate data that will then be sent to farmers. "Important data such as pest control information, and best wheat harvest time can be provided timely, which helps increase yield by about 25 kg per mu (0.067 hectare)," said Ren Liwei, an official of the local meteorological bureau. The station has also developed a mobile app to make the latest land data accessible to farmers, anywhere and anytime. With cameras installed in the fields, farmers are able to look at their land on the phone. If farmers find pests or any other problems, they can take photos, upload them and get help from experts via the app. "Messages will be sent to my phone telling me the best time to sow, spray insecticide, water, and harvest. We feel much more secure with big data behind all this," Zhang said. Jiang Huizhi, a senior agronomist in Xun County, has witnessed how experience and big data matter in agriculture. "In the past, farmers mainly relied on experience that was gained and passed on by generations. One example is the 24 traditional Chinese solar terms," he said. The 24 solar terms are important astronomical points on the Chinese calendar, and were added to the UNESCO list of Intangible Cultural Heritage of Humanity in 2016. "One farmer's proverb says, rice will be harvested in the field when Autumnal Equinox falls, usually between Sept. 22 and 24," he said. Now, farmers have come up with new sayings, one of which goes, "drones spray insecticides, and big data shows the right time to reap." "We didn't have technologies or advanced equipment in the past, so we had to turn our to experience, which has played an essential role in agriculture," he said. "Now, technologies such as big data and the Internet of Things provide farmers with accurate and scientific data in various aspects, helping us to better irrigate, manure, and spray insecticide," he added. According to Jiang, the wheat yield per mu has been increased from 200kg to 300 kg in the 1980s to 650 kg today in the county. "High technologies are especially helpful in forecasting disasters such as cold spells, gales and freezing weather," he said. "It is the trend to grow crops with big data," said Guo Yujie, associate professor with North China University of Water Resources and Electric Power. "The application of big data, high technologies and the Internet of Things will be stepped up, with fewer people farming in China." At Qixing farm, the largest paddy farm in northeast China's Heilongjiang Province, a big data center has been built, which receives data collected from high-resolution Gaofen-1 satellites. "The big data system has covered an area of 81,300 hectares at Qixing farm, providing data on land, environment, machine and other related business management," said Peng Rongjun, director of the farm. A total of 200 monitor spots, 20 meteorological machines and 20 sets of underground water-level monitoring equipment have been installed in the fields at the year-end of 2016, creating an Internet of Things that collects production data. Heilongjiang is China's largest grain-producing region, accounting for one-tenth of the country's grain output and one-fifth of the country's authenticated green food. The provincial agriculture department has been developing an agriculture big data service platform in the province since 2017. The platform consists of one data center, 16 cloud-computing platforms, and 84 sub-systems, providing data on planting and production, machine management, manuring, crop protection, green food and quality control, etc. A number of 1,359 machine cooperatives, 6,055 family-run farms and 27,000 machines can be monitored with the machine management control center, covering an area of 6.33 million hectares. Data on manuring can also be collected on an area of 8.67 million hectares, and on pest control over 2 million hectares. With the help of big data, smart agriculture is also on its way. At the 400-hectare vegetable greenhouse of Zhonghe Group in Hebi, the roller shades can be controlled to changes in light, temperature and humidity, all at the mobile phone. "It took much time and labor to manage the roller shades by hand, and workers sometimes had to work against big winds, which was quite tough," said Wei Aihu, director of the company's information department. 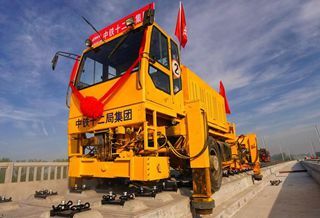 "Now, with the help of the smart control system, much labor has been saved, cutting down costs of nearly 800,000 yuan (about 115,246 U.S. dollars) each year," he added. The company has also been equipped with automatic irrigation, ventilation and waste clearing systems. "Big data helps us know about the environment accurately, thus reducing loss from meteorological disasters or risks. Productivity has also been lifted and costs cut down with smart equipment," he said. "Big data will be further applied in agriculture." China released a plan on the application and development of big data in agriculture in 2015, aiming to build a national-level agriculture data platform. So far, a number of tech companies have taken part in the development and application of big data in agriculture. Aliyun, Alibaba's Cloud computing subsidiary, has launched a cooperation program with Shaanxi Haisheng Fresh Fruit Juice Co. Ltd. to develop an agricultural smart system, with artificial intelligence technology applied. For example, the growth cycle of a sweet melon can be monitored by scanning a barcode. The company is able to control the whole process from sowing and growing, to harvesting and transportation, guaranteeing quality. "Agriculture in China has entered a new era with three data collecting systems, satellites in space, drones in the sky and the Internet of Things in the fields," said Wu Wenbin, a scientist with the Chinese Academy of Agricultural Sciences. A triangle-shaped robot, developed by Wu's team, is working in the corn field in Minzhu Township in Heilongjiang, planning a route for itself, and measuring the height of the crops and monitoring factors influencing their growth. "With such robots, we will be able to collect and analyze data, and operate machines on mobile phone, which will become the mode of agriculture in the future," Wu said.